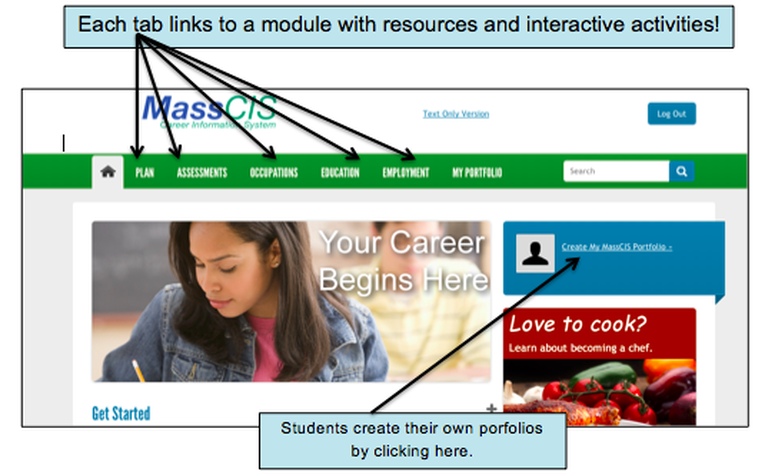 These sites cover different topics and include learning modules, interactive activities/assessments and links to additional resources on topics such as career exploration, skills/interest assessment, job training, job search process. O*Net Online is a more comprehensive version of My Next Move. Career Outlook: Career Planning for HS Students from the Bureau of Labor Statistics (BLS), is a government career portal designed for teens. There are various resources available on the website, including career planning tips and interviews with recent high school graduates. Sample Resumes: This site provides samples of resumes for students with and without paid work experience. Links at the bottom provide resume writing tips. Internships.com: Allows users to search for internship based on interests, job category, city, company. Includes tools for resumes, interviews, etc. Try the “Internship Predictor” to match personality and interests with internships. Idealist.com: If you know that you want to intern for a nonprofit organization, this is the perfect website for you. You can easily search for internships based on area of focus or spoken language, whether they’re paid or unpaid. Mediabistro.com: Focused entirely on careers in the media industry, this site lets you find internships and jobs in advertising, social media, TV and video, publishing, design, technology and more..
Indeed.com: Answer two questions on this website and find internships in less than a minute!